The fourth course jumps ahead somewhat to the Edwardian Age; a time of real food opulence (I’ve mentioned it before in this post here). Domestic ice cream machines were rather fashionable in the houses that could afford to buy one and to pay the staff to hand churn it. It was essentially a drum that could be encased in a mixture of ice and salt, which would drop the temperature enough to freeze the ice cream or sorbet reasonably efficiently. The contents would be churned so that only small ice crystals formed, giving the ice that soft and creamy texture we all know and love. Although ice cream had been eaten for many decades previously, during the early Twentieth Century the flavours were much more savoury than today. 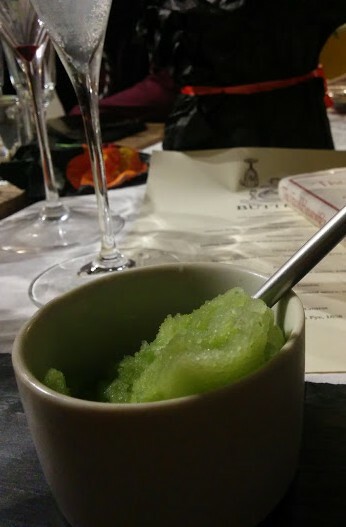 I chose this cucumber, mint and gin sorbet as I thought it would make a lovely refreshing little respite in amongst the other, larger courses, but I could just as easy have gone for pear and Stilton, tomato or Parmesan, to name but a few. I absolutely love making sorbets and ice creams – in all of the menus I have put together I’ve always found space for some. As soon as I’ve written up all of the courses, I will write a post on the history of iced desserts in Britain. In a blender, blitz the cucumbers, mint and lemon juice, and then pass through a sieve. Dissolve the icing sugar in the gin and add to the cucumber mixture. Freeze in your ice cream churn as normal. If you have no churn, pop in the freezer, beat every 30 or 45 minutes until almost frozen, and then leave to freeze properly. Make sure you remove the sorbet from the freezer around 30 minutes before you want to eat it.